Gladstone halfback Inia Katia capped off a memorable premier club rugby season by winning two awards at Wednesday night’s Wairarapa-Bush awards dinner at Copthorne Hotel & Resort Solway Park. Katia was a deserving winner of the premier player of the year award, and was also recognised for finishing as the top try scorer in the premier grade after crossing for a remarkable 21 tries. He beat out tough competition from Carterton captain Lachie McFadzean, and Eketahuna forward Sam Gammie. Female player of the year went to Brodee Walker, who was a standout performer for Makoura College this season. College player of the year was one of the most hotly-contested categories, with Wairarapa College’s Sam Smith going up against Rathkeale College pair Jack Eschenbach and Harry McKay. Smith was picked as the winner in the end, after leading the Waicol First XV through a memorable campaign in which they finished fifth in the Wellington premier grade. Maori player of the year went to Isaac Bracewell, who performed at a high level all season at halfback for Carterton. The other nominees were Martinborough’s Tristan Flutey and Tipene Haira, who are both expected to feature regularly for Wairarapa-Bush throughout their Heartland Championship campaign. Haira did enjoy success in another category, taking home the trophy for top points scorer in the premier grade. Club of the year was won by Carterton ahead of Gladstone and Martinbrough, while Chris Jefferies was named referee of the year. Jefferies also hit a special milestone this season, refereeing his 150th premier game in June. Coach of the year went to the man at the helm of the Gladstone premier side, Steve Thompson. 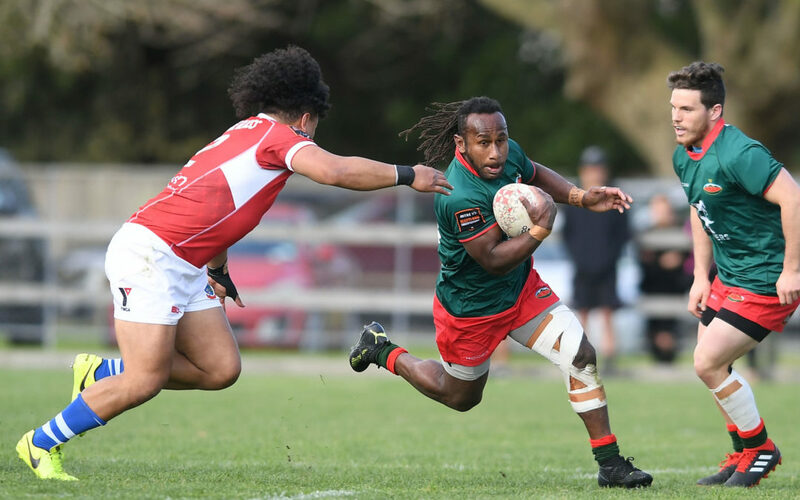 Thompson guided Gladstone to their second consecutive Tui Cup title this year, and that was enough to see off the challenge of Carterton/Makoura College coach Chris Senior, and Puketoi coach Jerome Pitt. Pioneer’s Te Awhiorangi Henare-Kuru won the best and fairest award. Premier player of the year: Inia Katia [Gladstone]. Female player of the year: Brodee Walker [Makoura College]. Maori player of the year: Isaac Bracewell [Carterton]. Coach of the year: Steve Thompson [Gladstone]. Volunteer of the year: Cath Thompson [Gladstone]. Senior administrator of the year: Donald Irvine [Puketoi]. JAB administrator of the year: Malcolm Jasper [Tuhirangi]. College player of the year: Sam Smith [Wairarapa College]. Personality of the year: Richie Wards [Featherston]. Referee of the year: Chris Jefferies. Club of the year: Carterton. Premier top points scorer: Tipene Haira [Martinborough]. Premier top try scorer: Inia Katia [Gladstone]. Best and fairest: Te Awhiorangi Henare-Kuru [Pioneer].